The first thing I will note about Lassoing the Sun by Mark Woods is that I cried often. You might think that the vivid descriptions of the beauty of our national parks prompted my tears. 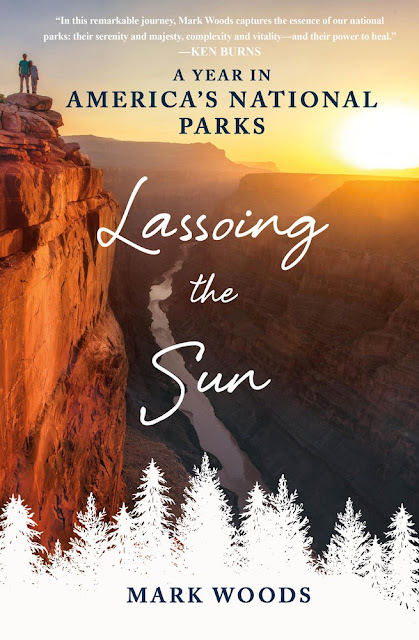 Mark Woods did chronicle evocatively the splendor of our national parks from the most wild and remote places to our most urban and nearby settings but it wasn't the natural landscape that elicited tears. This book is also a memoir of the last year of Woods' mother's life as well as an autobiography of his own childhood and adult life spent in our national parks. The stories of the lives of his family set against the backdrop of some of our most shared sacred spaces is highly emotional. Much has been written about the origins of our national parks system. Woods set out to answer the question: what is the future of the national parks system especially in light of radical changes in technology and climate? To address the question, Mark Woods visited 15 national parks. The book is organized as a year long itinerary of visits to national parks with each chapter telling the story of a park and its resource management challenges. For example, the issue of dark skies is discussed in the context of Acadia National Park; the ripple effects of species reintroduction in the context of Yellowstone; and the fit of urban parks in the context of a predominantly "wild" parks system. The observations that Woods' makes during his visit to Gateway National Recreation Area in Brooklyn underscore a quote he includes earlier in the book: "'Can national parks evolve successfully in a world where nearly all of their founding assumptions have been proven wrong'?" Because the book is both journalistic reportage and a memoir, Woods extracts life lessons and insights from the approaches to solving challenges in our national parks. Without quoting literature on the benefits of time spent in nature on our emotional and mental well-being, he makes a solid case for the value of landscape in not only making memories but also in holding memories. I already mentioned that his mother dies during the course of the travels that form the basis of this book. But, also, he engages with a family who lost a son, Gabe Zimmerman. Both Woods' mother and Gabe Zimmerman had strong connections to national parks and the outdoors. Both sets of families relied on the landscape as almost an experiential album of their deceased loved one. When was the last time you heard the rain fall from start to finish? Do we give undivided attention to natural phenomenon? I recommend Lassoing the Sun! If you love natural histories, memoirs, travelogues, this book is a great blend of these genres. Mark Woods' ties our lives to our landscapes. He celebrates our commitment to the national parks model and holds us responsible for sustaining this particularly American legacy. This book was provided for review, and I am glad to have read it.